Determining the short-circuit rating of the breaker requires knowledge of the prospective fault current at the panelboard. Following section provides a simple method to obtain this current magnitude. 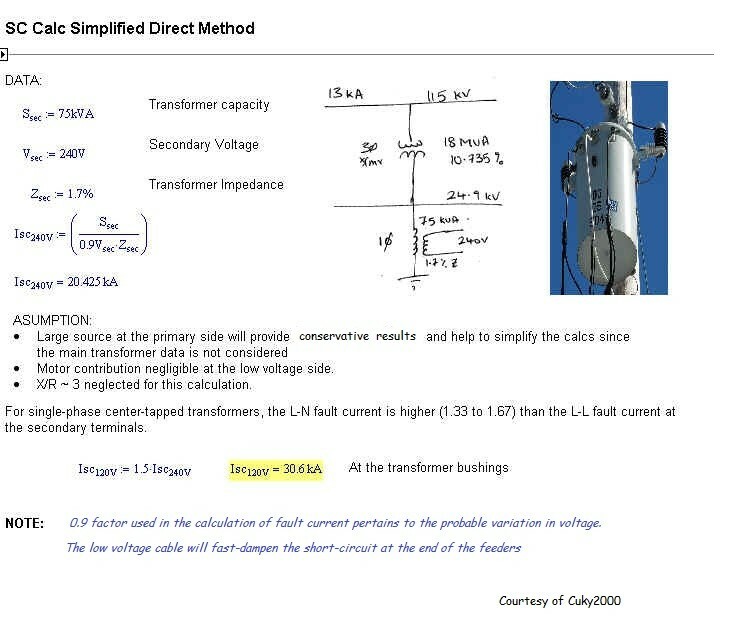 Let’s start with calculating the prospective current from the nearest transformer. The short circuit amps obtained from this method ignores the source impedance. If you do have this impedance then use the following equation. Ofcourse, you will be more accurate with the result now. However, source impedance is not easily available. This piece of information is typically obtained from the utility serving you. %Zsource encompasses the impedance of the entire power system, calculated upto the primary side of the indicated transformer. Click on figure 1 for an example. When selecting a circuit breaker be wary of choosing breakers that will become marginally rated i.e. fault currents are 80 – 100% of the breaker rating. In circuits with X/R ratio greater than 15 (i.e. highly inductive circuits), the magnitude of prospective fault current might be greater than the calculated current. Why? Well, in AC systems, fault currents have asymmetrical waveform. The asymmetry (due to DC offset) gradually tapers off to become symmetric. See figure below. The rate at which the asymmetry decays varies as a function of the circuit X/R ratio. The higher the X/R ratio of a circuit, the higher the fault current magnitude a circuit breaker has to handle. So, assuming that you are oblivious of the system X/R at the point where you are installing the circuit breaker and that the high current magnitude will persist for a while, it is prudent to select circuit breakers such that the calculated fault currents are only 80% (or less) than its short-circuit rating. Refer to National Electric Code for sizing the breaker.